Europe: its cultural diversity twinned with a managable size and excellent transport links make for an immensley rewarding travel experience. No matter where you go, cities everywhere from Seville to Helsinki always attract a wave of travellers, especially during the summer. Many backpackers and travellers want to spend at least one month in Europe to get a real feel for this historic and diverse yet compact continent. Plane tickets can be cheap if you are willing to go off season or get the right deal, but when it comes to transport train is king. Not only there are trains everywhere, with both regular and high-speed options, but also programs like Eurail and Interrail let you use almost the whole train network for a fixed amount of money. 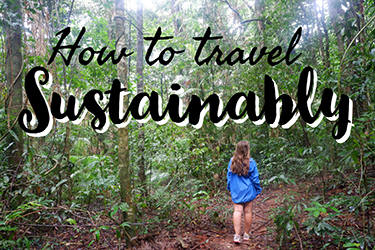 And of course, taking the train is a great way to protect the environment – train travel is one of the best sustainable travel tips! This is how I navigated the continent during my one month Europe trip. If you are planning to do something similar, fear not! Train distances, times, itineraries, reservations… Been there, done that. And now I’m sharing it with you while you’re sorting out your Europe travel itinerary, so everything runs smoothly. The first step on this Europe itinerary planner is to purchase a rail pass. If you are a European citizen or a non-European who is living in a European country, the Interrail Pass is what you need. It is cheap, it gives you access to the European train network and includes some really nice extras: from included buses in some cities to discounted ferries and tours. For example: do you want to hop to Morocco from the south of Spain? The Interrail Pass gives you a 30% discount in the ferry that crosses the strait of Gibraltar! 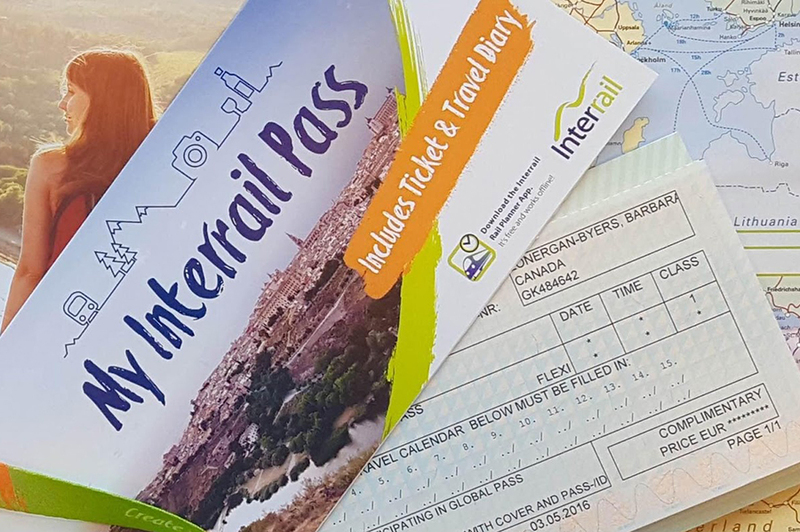 Click here for more information about the Interrail Pass. 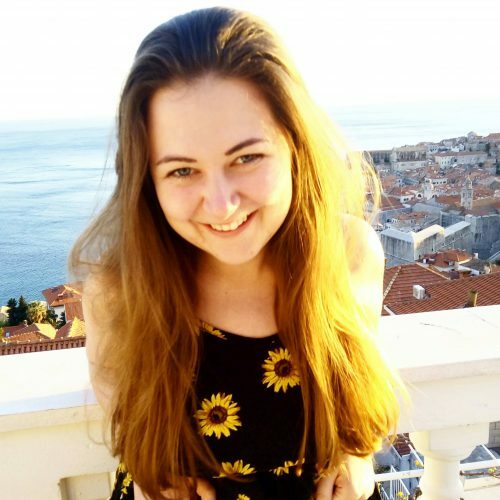 What happens if you are not eligible for the Interrail Pass? The good news is that you can still buy a rail pass; the Eurail Pass. The bad news is that is going to cost you a little bit more. Everything else is roughly the same. Some of the benefits and discounts might vary, but most of them are still there. No matter which one you choose there are plenty of options depending on the length of your trip and which countries you want to visit. If you are an under 27 year old backpacking Europe or over 60 and seeing the highlights you’ll get a nice discount; and you will also get some money off if you are travelling with children. The most important thing to consider when choosing a rail pass is the length of time in which it will be valid. For a Europe trip itinerary 4 weeks is a great amount of time to explore the continent, so most people opt for a month-long interrail pass. While you can buy one that will work for an entire month every single day, bear in mind that you probably are not going to take a train every day. This is important because you can buy one that will allow you to travel just for a few days, but will be valid for an entire month. For example, one of the most popular options lets you travel for 15 days in a month. That means you can use the pass for 30 days, but you are only allowed to travel on 15 of these days. This is very useful because usually, you are not going to take a train every day, thus the pass is substantially cheaper. The 30/15 day pass is roughly 150€ cheaper than the 30/30 day pass! Once you have the pass, planning is important. If you want to take a night train or a high-speed train you will probably need to make a reservation. Of course, you don’t have to use high-speed trains at all, but it saves a lot of time! If you need some help with times and distances, this wonderful map lists all the major destinations and the time it takes from one to another. And don’t forget to check out the Rail Planner App, another great tool to let you organize the trip. If you’d rather sit back and let someone else show you around this wonderfully diverse continent, you have options! Taking a tour around Europe with Contiki or G Adventures will show you the highlights and help you meet great friends in the process. Water bottle – you can drink the tap water in many parts of Europe, but for those places that you can’t, a water to go bottle is a great solution. Most of Europe enjoys (subject to opinion!) four seasons, so pack accordingly. In the summer, you’ll be wearing mostly shorts and t-shirts but the northern cities could be chilly, so be sure to pack some trousers and jackets as well. In spring and autumn, you’ll want a mix of summer and winter clothes. In winter, it can get very cold, so make sure you incorporate a coat, a scarf, and gloves to your Europe packing list! London is a great place to start your one month Europe trip. Heathrow is Europe’s biggest airport, and it is really easy to reach from almost anywhere in the world. From the airport, you can easily get to the city centre via rail or coach links, where the hostels are located. 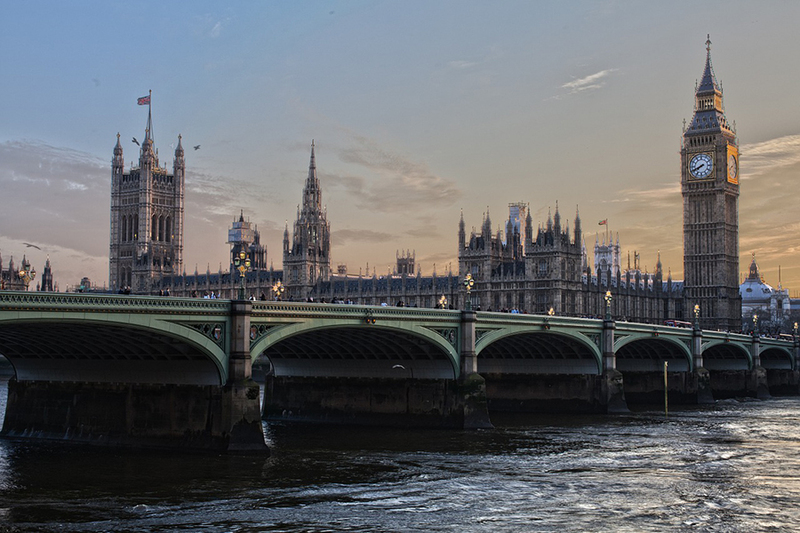 You can also fly into Gatwick, Stansted and Luton – all of which are well connected to Central London. London is the biggest city in Western Europe and one of the most popular destinations in the world, so there are plenty of activities to do. You can join one of the many free walking tours, or explore the city on your own. The main attractions of London include Buckingham Palace, Westminster Bridge and the Parliament, the Tower Bridge and the Tower of London, the London Eye, Covent Garden, the Soho, Piccadilly Circus, Trafalgar Square and more… if you are willing to walk for a bit you can easily visit most if not all of them in a day. Or you can always take the famous London tube! That counts as cultural experience, doesn’t it? 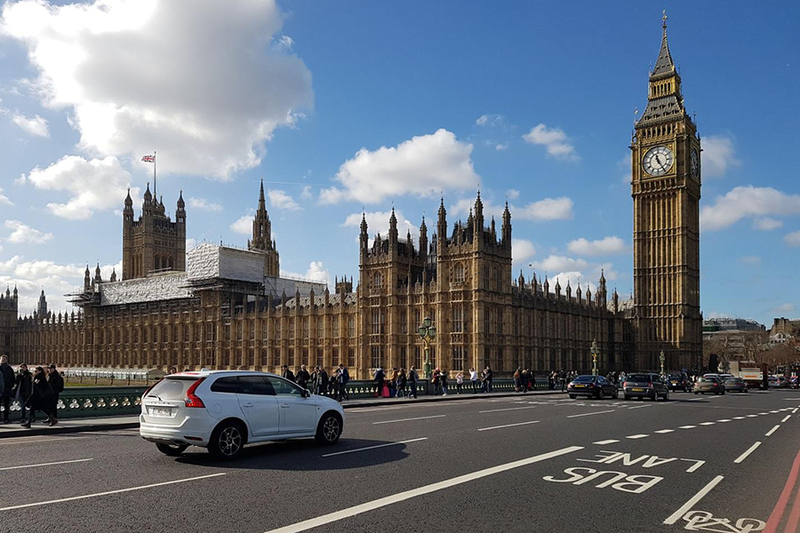 Once you’ve adjusted to London life and know where the landmarks are, you’ll want to delve a little deeper into some of the best bits of the capital. Westminster Abbey is a great place to see to experience some of the best British histories as it is where hundreds of the most notable characters of the UK are buried and where the kings and queens of Britain are crowned. Another London must-do for history fans is going on a tour inside the Tower of London. Here you can learn all about the fabled stories of this impressive building and see the crown jewels. If you are after some more contemporary attractions, how about doing a Harry Potter tour to see some of London’s most magical sights or visiting the London Dungeons? Read More – Everything you need to know about backpacking London. After two busy days, you might want to go easy. Maybe start your day with a visit to the British Museum, or walk through Hyde Park or Regent’s Park. If you want to try some local food you could visit one of the historic pubs; like The Spaniard’s Inn which has almost 500 years of history. If you like shopping, Oxford Street is where to go (be careful, your backpack gets heavier with everything you buy!). And the West End is a great choice if you are interested in theatres, or check out the galleries and museums of Kensington. No matter your preferences, there’s always something to do in London! Bus transfer and tour of the Warner Bros Studios. Click here for more information. Cruise down the River Thames, from Westminster to Greenwich. Click here to book. 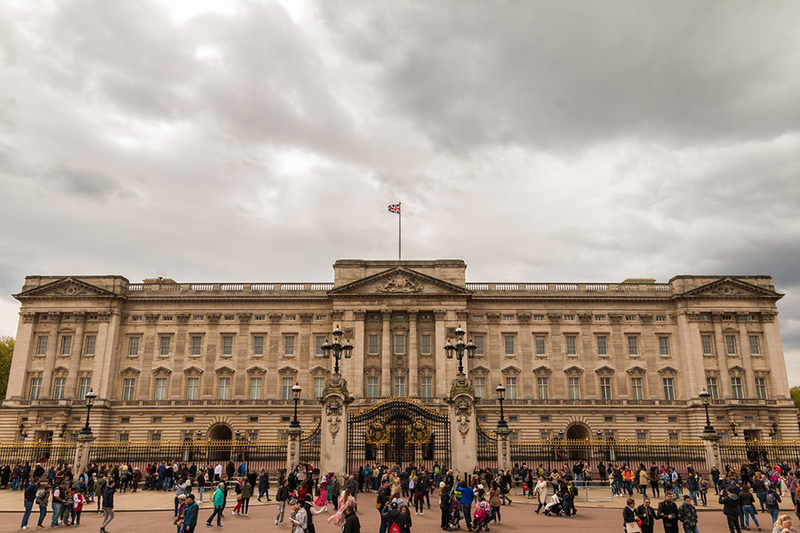 Visit Buckingham Palace’s State Rooms (only open for visitors from late July to early September). Click here to find out more. See the most magical sights of the capital with a Harry Potter tour. Click here to reserve tickets. Hostel – There are so many hostels in London, some of which are surprisingly budget-friendly. I’d highly recommend WOMBATS city hostel, which has a fun, social atmosphere, free wifi, USB outlets for each bed and ensuite bathrooms. Click here for rates or to read more! Hotel – The fantastic value Hotel Moonlight is located in the upmarket Kensington and Chelsea area. This is near where all the museums are, and a short tube right to other London attractions. The hotel rooms offer mini-fridges and microwaves, as well as city views from soundproof windows. For rates and to book, click here. 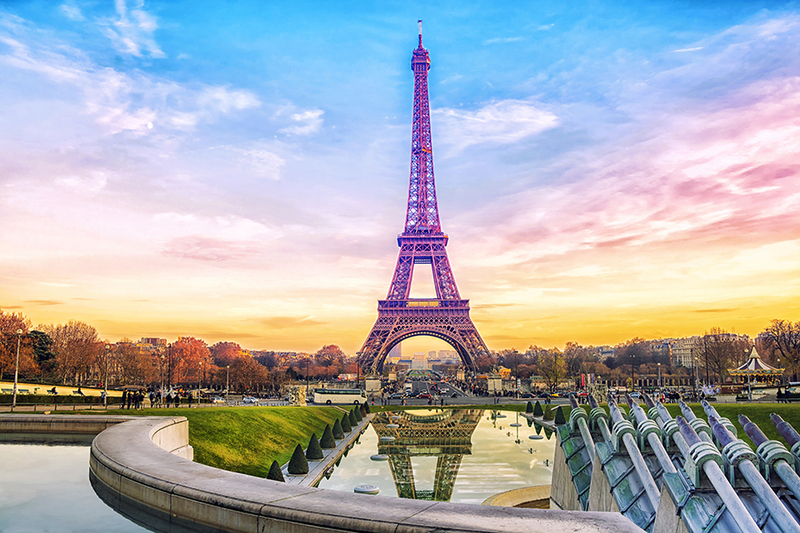 After a few days in London, it is time to go to the City of Light for the next leg of your one month Europe itinerary. Paris is just over two hours away from London by train. The Eurotunnel connects the UK with the rest of the continent, and you can take a train, the Eurostar, from St. Pancras station to Gare du Nord, in Paris. However, be aware that this train is NOT included in any of the rail passes, so you will need to buy it on your own! If you’re after a cheaper way to reach Paris, budget coaches make the 10 hour journey daily. It will be the afternoon by the time you arrive, so I’d recommend a stroll around the Montmartre district, where famous landmarks like the Basilica of the Sacré Coeur or the Moulin Rouge are located. Start your Paris itinerary with a nice breakfast by visiting a local boulangerie and buying some fresh and delicious croissants. Maybe have a coffee in one of the many cafes in the city and get ready to start exploring. Paris is a big city, so using its public transportation is a good idea. If you want to start with the most famous landmarks of the country visit the Champ de Mars and see the Eiffel Tower in all its glory. Ascending the iconic monument first can be tempting, but I personally prefer leaving it for the sunset, to watch the city glow in beautiful shades of orange from above. For the rest of the day, you can visit the famous landmarks, like the Notre Dame Cathedral and the Arc de Triomphe, or take a slow and relaxing walk through the Tuileries Garden. When I have multiple days in a city I always try to leave all the cultural activities for the last day or days, since they are more relaxing and less demanding than going from landmark to landmark. Paris has so many of them that you would need a week just to go to the main ones, but within a day you can probably manage to visit the Palace of Versailles and visit the Louvre Museum. If you really want to cram something else today, the Musée d’Orsay or the Rodin Museum are a good options too. Of course, don’t forget to go at least once to a proper French restaurant and enjoy the delicious cuisine of the country! 1, 2 or 3 Day Hop On Hop Off Bus Tour. Click here for details. Paris in One Day. Click through to learn more. Catacombs Special Access Tour. Click here for more information. Hostel – Plug Inn Montmarte by Hip Hop Hostels (pardon the mouthful) is a great place to rest your head. 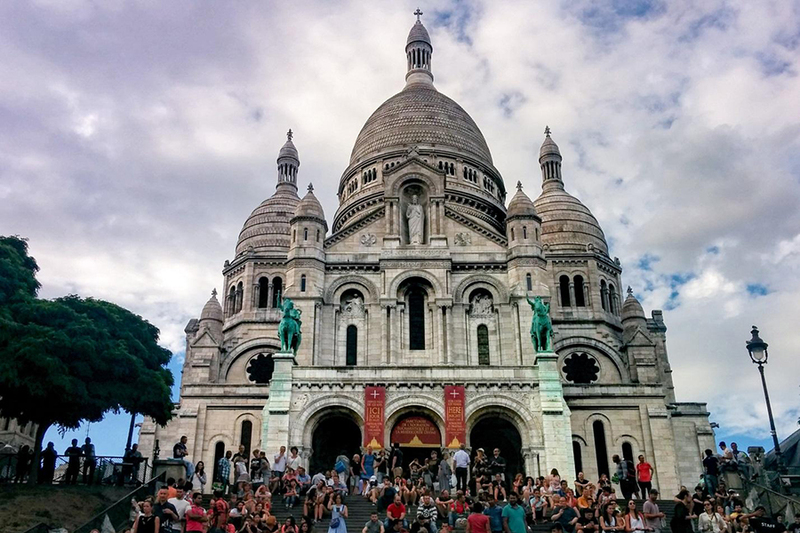 This budget accomodation option is only 600m from Sacre Couer Cathedral and offers free wifi, a terrace, rooms with private bathrooms and an included buffet breakfast. For rates and to book, click here. Hotel – The newly renovated Dream Hotel Opera is popular with those looking for somewhere perfect to kick back and relax. Rooms are soundproofed and have patios, and the hotel enjoys its own sauna. For rates and to book, click on this link. After a few days in Paris it’s time to visit one of my favourite cities in Europe; which will be a highlight of your one month Europe trip for sure! The train from Paris to Amsterdam takes between three and four hours. Sometimes you have to switch trains in Brussels, but the time is about the same. 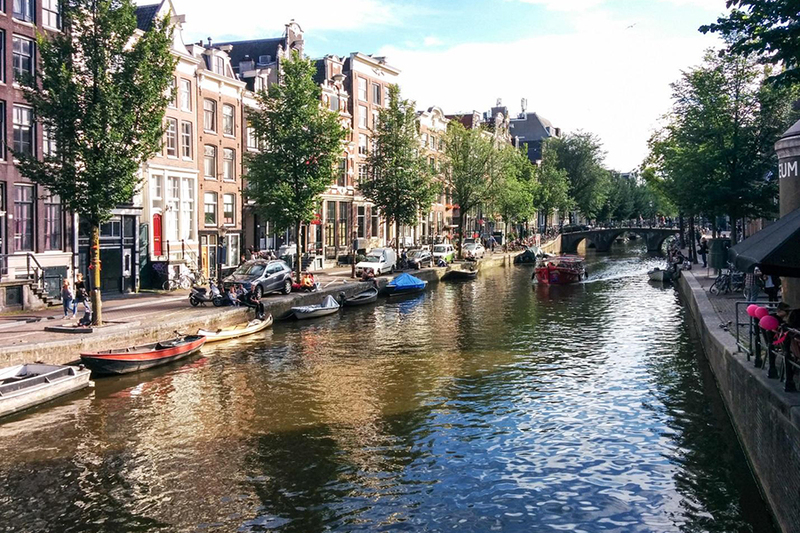 After arriving in Amsterdam Centraal you will be almost in the heart of the city, where the famous canals are located. Spend the afternoon just relishing the city centre and its unique ambience, enjoying its architecture and modern culture. Remember to watch out for bikes! There’s no better way to get to know the city better than joining a walking tour. Amsterdam is a city with a long and interesting history, where all the buildings tell a different story. The tour will answer some questions you inevitably might have about the unique architecture and give you some fun facts about the city! You can rent a bike if you want to explore outside of the city centre; they are available everywhere. In the evening, joining one of the walking tours explaining the history of the Red Light District is one of the most famous things to do in the city. 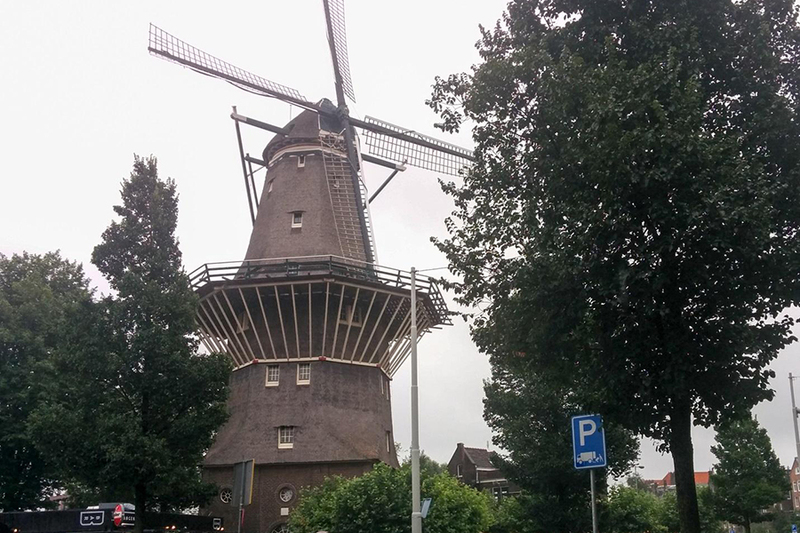 If you want to see one of the famous Dutch windmills you can visit the last one standing in Amsterdam, just a 30 minutes’ walk from the city centre. However, The Dutch are not only famous for their tulips, dykes, and windmills, but also for their many famous painters. From Rembrandt to Van Gogh, the museums of Amsterdam are home to hundreds of famous paintings. Probably the best ones to visit are the Rijksmuseum and the Van Gogh Museum. 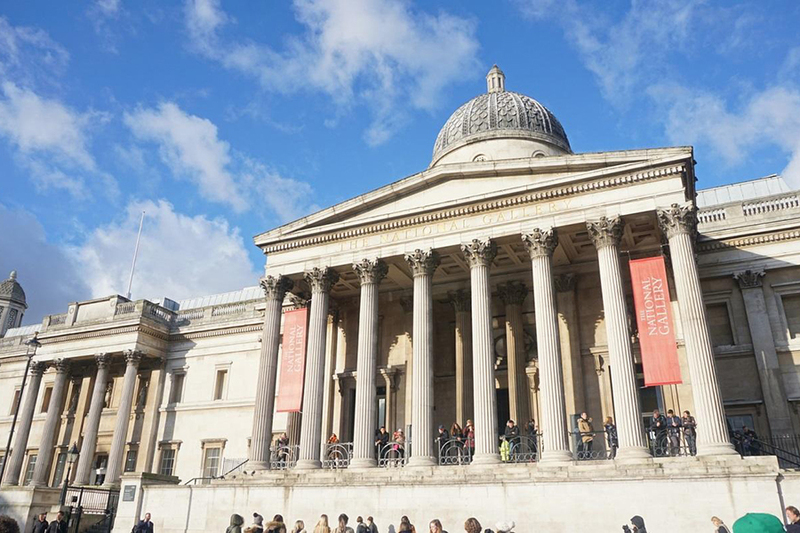 It takes a while to see them, so it’s best to choose your favourite one or two museums and stick to them! Another worthwhile yet harrowing cultural place to visit is Anne Frank’s House, but make sure to book it in advance to avoid the queues. When night comes, you could do a pub crawl through the many Amsterdam bars, which is a great way of getting to know your new hostel friends and having some fun in the Venice of the North. Evening Canal Cruise. Click here to read more. Bike Tour of Historical Amsterdam. Click here to book today. Amsterdam in WW2: History of Anne Frank Tour. Click here for information and tickets. Hostel – Ecomama is a great hostel, located really close to the city centre. It has comfy beds, hot showers, clean dorms with beds with their own socket and a big area with games. It also organizes all kind of activities, like walking tours or pub crawls. It just took me 15 minutes to reach it from the train station. Click here for more details and to book. Hotel – Hotel Levell offers fully equipped bedrooms, a buffet breakfast each morning, and 24 hour reception. The interior is modern and the staff are very accommodating. Click here for more details and to reserve your stay. Germany has a huge amount of historic cities, and Frankfurt is but one of them. If you take an early train from Amsterdam Centraal, you’ll be able to spend the afternoon exploring Frankfurt before heading to Bern the next day. 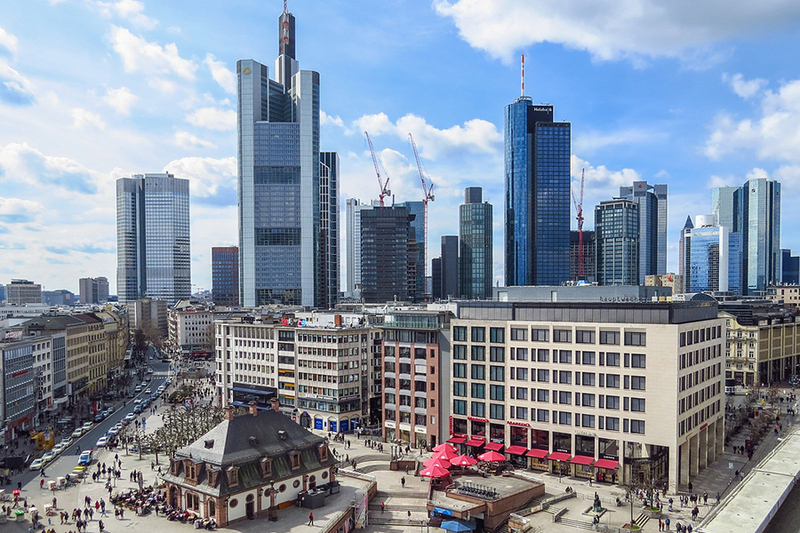 Frankfurt isn’t quite up there with the glitz and glamour of London, Paris and Barcelona, but it is a worthwhile stopover on your one month Europe trip. Rent a bike for a cheap way to see the city and explore the Old Town, or take the Ebbelwei Express, which tours the city’s major landmarks and serves up apple wine. A great way to see the city! Hostel – Five Elements Hostel Frankfurt offers a terrace with barbecue facilities, fully heated rooms, free WiFi and bicycle rental services. Choose from twin, double or dorm rooms – or if there’s a group of you, why not rent out its apartment? Click here for rates and to book. Hotel – You can enjoy studios and apartments at Capri by Fraser, which has a bar and gym on site. Each room has a desk and flat screen TV, and is tastefully decorated. Check rates and reserve here. Get up early to take the train to Bern, so you can enjoy the afternoon in the city. The Swiss capital is a small city, but probably one of the prettiest ones in Europe. Bern is a fantastic launching pad for exploring Switzerland by rail. 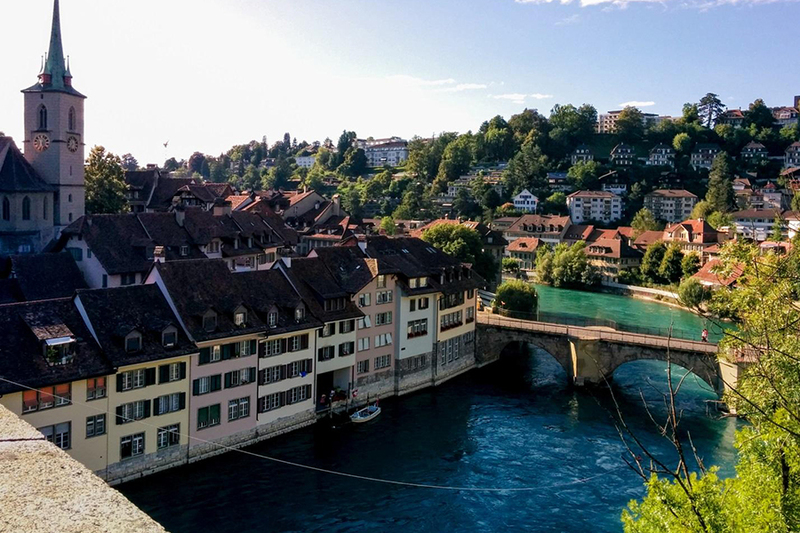 Bern is a gorgeous city, with beautiful buildings and surrounded by a stunning landscape. Take a walk through the streets and discover all the city has to offer, from the Zytglogge, the tower with a 15th-century astronomical clock, to Einstein’s House, where he lived when he developed his Theory of Relativity. Don’t forget to walk all the way up to the Rossengarten, where you can have a fantastic panoramic view of the whole city. 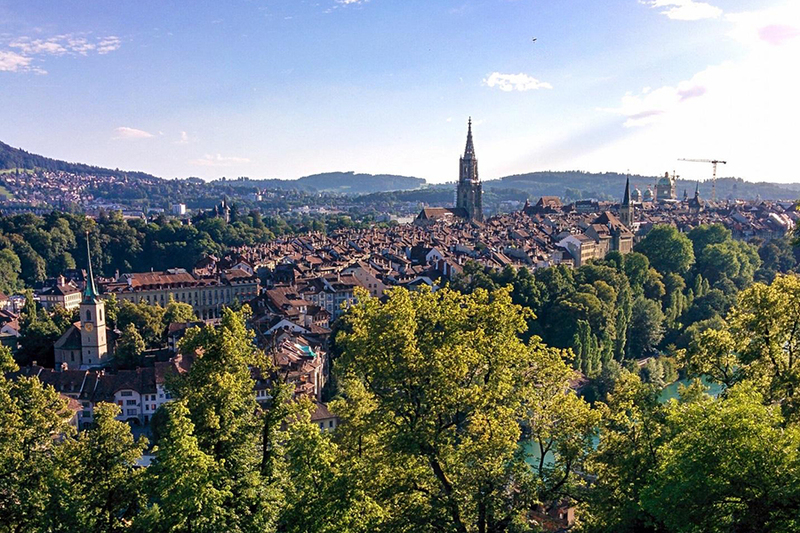 Here’s some more information about how to spend a perfect day in Bern. Hostel – Beautiful as Bern may be, it’s expensive! Staying in a hostel will reduce the price somewhat – Bern Youth Hostel is super clean and well facilitated, with an included breakfast which will help you save some money during your trip. There are not many hostels in Bern, so it’s recommended to definitely book this one in advance before it sells out! Check prices and book here. Hotel – B&B Gutenberg is an affordable choice in the city. Highly rated by previous visitors, the property has excellent free wifi, some in-room cooking facilities and the price includes a delicious breakfast. Click here for prices and to book. Milan, for me, was just a quick stop before going to Venice, but that doesn’t mean there’s nothing to do here. It’s well worth a stop on your Europe itinerary! Probably the biggest thing to do here is going to see the Last Supper. The famous painting is located at the Basilica di Santa Maria delle Grazie, and to see it you have to book in advance or join a guided tour. Of course, the most iconic landmark of Milan is the Duomo di Milano, the massive white cathedral, third largest church in the world. Right next to it the Galleria Vittorio Emanuele II, which has some of the most expensive and elegant shops and restaurants in the city – maybe not suitable for a backpacker’s budget, but fun to look around! Hostel – Ostello Bello Grande is located in the middle of the city, next to Milan Train Station; so it’s a perfect place to base yourself when travelling to and from the city by train! There is a 24 hour reception and 24 hour snack bar, a communal kitchen, a great atmosphere, beautiful surroundings and breakfast and dinner is included! Check rates and reserve here. Hotel – Hotel Milano Castello has a modern feel, with chic, air conditioned rooms offering comfy beds and luxury bathrooms, some with a spa bath. The hotel is in a prime location for exploring the city and has wifi throughout the property. Click here for rates and to reserve a room. 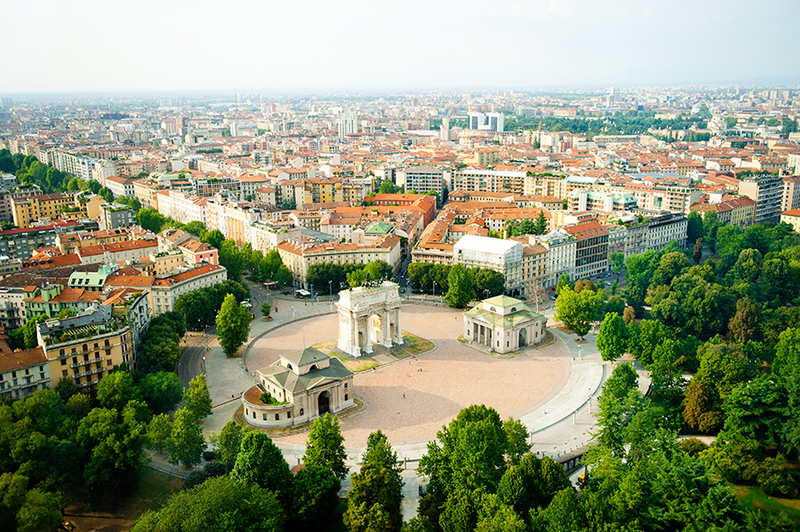 Venice is just two and a half hours away from Milan by train. The Serenissima is one of my favourite cities of Italy and is a highlight of many people’s Europe tour itinerary. The beauty of the buildings and the canals, the wonderful Mediterranean weather, the rich history… it’s no wonder why so many people fall head over heels for Venice. Venice has so many things to do. If you are like me probably walking the streets finding beautiful buildings like the Ponte di Rialto and looking at the beautiful canals is more than enough. Or maybe go to the Piazza San Marco to have a –very expensive- coffee and see the Basilica. Taking a gondola ride is also a possibility – but be aware, private gondalas cost up to 100€ for an hour! Ca’ d’Oro is a private palace that is now an art gallery and museum which is well worth exploring, and the Rialto Bridge and Market are stunning on a sunny day. Once you think you’ve seen all of Venice’s highlights, there is still so much more to explore. Ca’ Rezzonico is a patrician palace which demonstrates life in 18th century Venice, and the Penny Guggenheim Museum exhibits some of the most impressive early modern artworks in Europe. You can also take the Vapretto Line to see some of the best sights of Venice from the water. 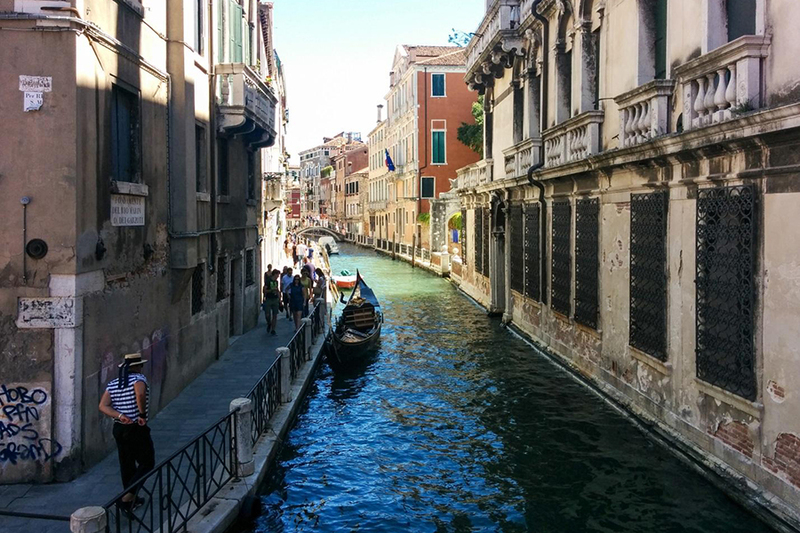 20 minute shared gondola ride – a great budget way to do this iconic Venetian experience! Click for more details and to book. Create your own carnival mask workshop. Click here to reserve tickets. 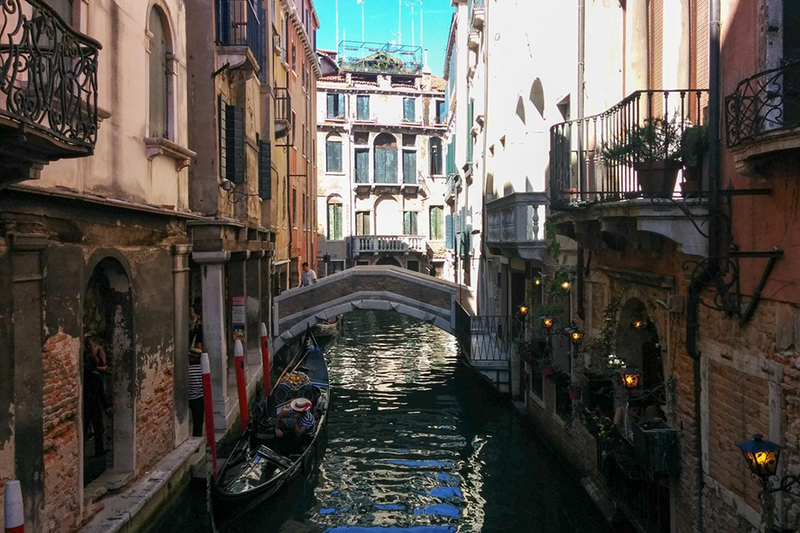 Hostel – The biggest problem with Venice is how expensive everything is; especially accommodation! That’s why instead of staying in the city I went to a cheap hostel in Mestre, the mainland of Venice. Since I had the Interrail Pass I could take the short train to Venice for free, saving a lot of money. Check rates for the cheap and popular Anda Venice Hostel here. Hotel – Palazzo Veneziano is located close to the main attractions; but the hotel itself is so fantastic you might struggle to leave! With luxury features like marble bathrooms (some with spa baths!) and comfy beds, as well as an included breakfast, the hotel offers affordable luxury in the heart of the city. Click here for rates and to book today. 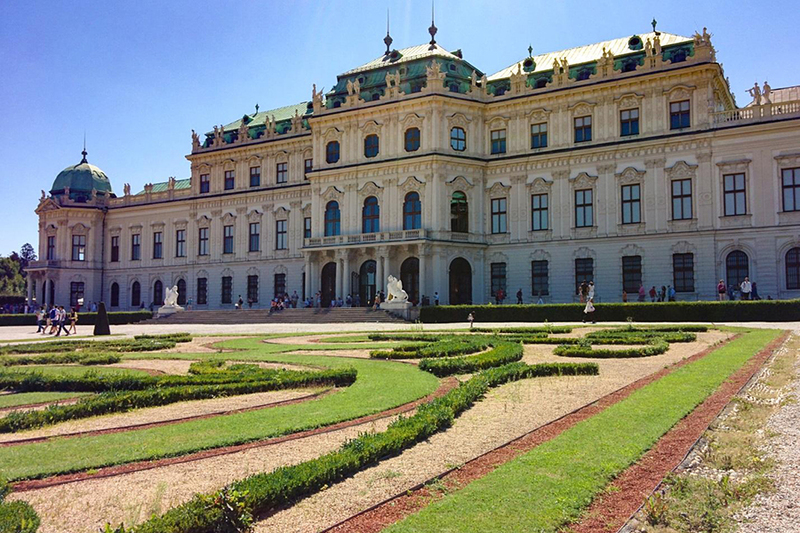 The capital of Austria, Vienna is a beautiful historic city with plenty of amazing cultural activities. You won’t see a city like it during your month in Europe! The 2 day Vienna Pass includes entry to more than 60 of the capital’s top attractions and the Vienna sightseeing bus. At €79, it’s not cheap, but Vienna isn’t exactly budget friendly, and if you want to see all of the sights it will save you money. Taking the sightseeing bus will orientate yourself in the city. A stroll around the old town is a must, as well as seeing the Rathaus, Hofburg, The Museum Quarter and St Stephen’s Cathedral. Other great attractions to enjoy in Vienna are Belvedere Palace, Vienna Stadtpark, Hundertwasser House, Votive Church and the Parliament. Make sure you factor in enough time to stroll around the beautiful old town as well. 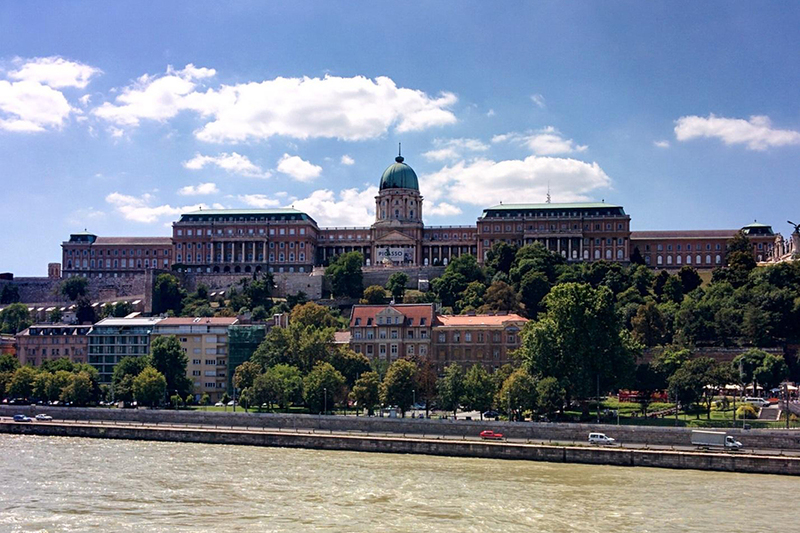 Vienna to Bratislava Boat Tour – cruise the Danube and get a taste of Slovakia with this return day trip. Click here for more information and to book. Walking Tour By Night – discover the spooky side of Vienna after dark. Click here for rates and to reserve your spot. Hostel – Our friends, WOMBATS, are back with another excellent hostel in Vienna! A great place to meet fellow backpackers, WOMBATS is great value and has a 24 hour reception. The decor is modern and stylish and a buffet breakfast is provided each morning. Click through to read more and book today! Hotel – Hotel Stefanie, the oldest hotel in Vienna, provides rooms at great deals. Air conditioning, private bathrooms and satellite TV are provided in each room and its adjoining restaurant provides Austrian and international cuisine. Book by using this link. The train ride from Vienna to Budapest is supposed to be three hours – although it can take up to five! But it’s worth it when you arrive; Budapest is a fantastic city, where you can see the distinct mix between Soviet and imperial buildings, which gives the city a unique look. Two days in Budapest during your one month Europe itinerary is enough to get a taste for central Europe; although be warned, you’ll be wanting to return! Budapest, with its beautiful architecture, is a fantastic place to explore by foot. One of the best places to see its buildings is the Andrássy Avenue, with incredible constructions like the Hungarian State Opera House. Another great spot is the Parliament Buildings, the biggest building in the city at the time of construction. Right on the other side of the river, the Fisherman’s Bastion is another must-see ; the 19th-century white fortification is not only one of the most beautiful parts of Budapest, it also offers a great view of the city. If you’re not exhausted after a whole day walking the city, head back to Andrássy Avenue and go in the opposite direction of the Parliament to find the Heroes’ Square, a huge square decorated with statues of the Magyars, the nomad central Asian warlords that founded the country a thousand years ago. The Heroes’ Square is just the entrance to the massive City Park, another brilliant point of Budapest and, of course, filled with majestic buildings showing off the wonderful 19th-century architecture of the city. Here you can also find some of the famous Bath Houses, where you can relax and swim – although beware, the queues are sometimes gigantic! End your trip by visiting one of the Ruin Pubs which are huge pubs, and clubs built in the ruins of the old imperial and Soviet buildings. Budapest is one of the best places in Europe to party hard if that’s your thing! Night Cruise on the Danube. Click here for more details. Hostel – Big Fish Hostel is in a really good location, the people working there are amazing and it has clean and comfortable beds. There is also free coffee in the mornings! Click here for more details and to book. Hotel – Danubius Hotel Helia is 15 minutes from the historic city and features a popular spa, a good gym and a swimming pool. The rooms are clean, comfy and modern. Check here for more details and book today. From the big Budapest to the tiny Slovenian capital, Ljubljana offers a peek into the Balkan countries, showing you another side to the continent on your Europe trip itinerary! Green fields, emerald forests and crystal blue lakes and rivers gives the whole of Slovenia a fairy tale look. 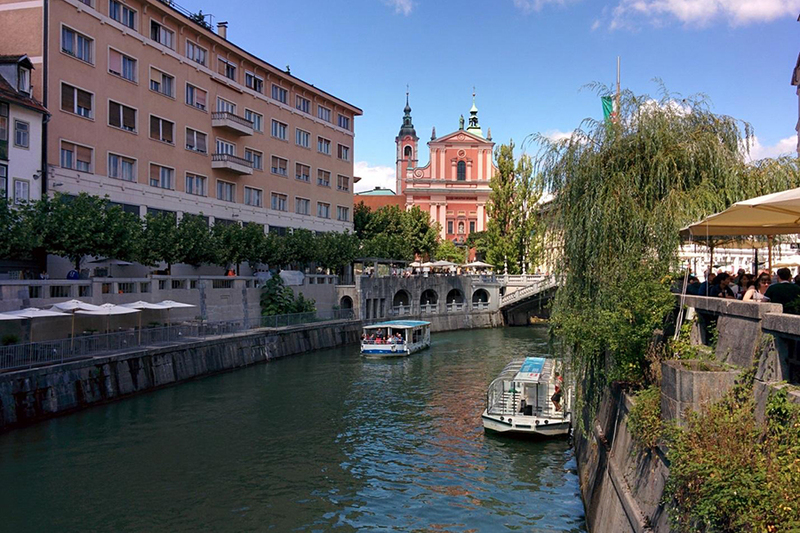 Ljubljana is a small city that blends in perfectly. It doesn’t have many landmarks, besides the castle and the Dragon Bridge, but I just love to walk through the streets. Hostel – Hostel Tresor is located in the centre of Ljubljana, and is listed amongst the most unique hostels in the world; it is located inside a former bank and offers free WiFi as well as rooms with air conditioning. Each bunk has privacy curtains. A bar and grocery shop are located in the same building. Check rates and reserve by clicking here. Hotel – If you enjoy city views and modern comfortable rooms, Hotel Lev is for you. There are plenty of spots around the hotel to relax, and a buffet breakfast is included in the morning. Book by using this link. 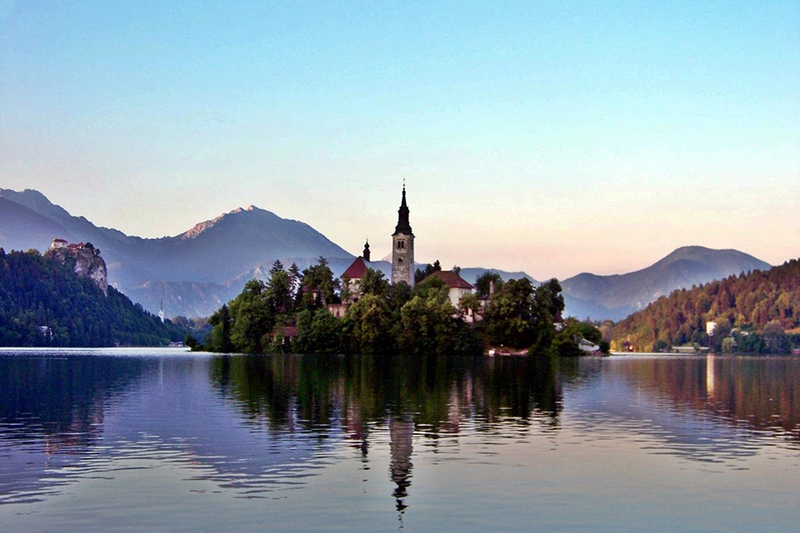 Lake Bled –or Bled Jezero in Slovenian- is probably the most famous landmark in the whole country. Taking a train or coach to the north is really easy from Ljubljana, and there are plenty of things to do and hostels in the area. For your day in Bled, I recommend walking around the lake and kayaking to to the island in the centre, which has a church and a spectacular lookout over the lake. Hostel – You can either do Lake Bled as a day trip from Ljubljana, or stay at the lake. Jazz Hostel is extremely traveller friendly, with helpful staff, use of kitchen included and a great atmosphere. Breakfast is not included in the price, but at just 5 euros for a huge plateful, it’s impossible to turn down! Check rates and book by clicking here. Hotel – with beautiful views over the lake, a delicious breakfast and clean facilities, Guest House Mlino is a great choice. Click here for rates and to book today. Going to Verona from Bled Lake takes a while. I had to go back to Ljubljana and from there go to Trieste. Once in Trieste, there is a train that takes around 4 hours. Be sure to leave early to reach Verona in time to see some of the attractions! 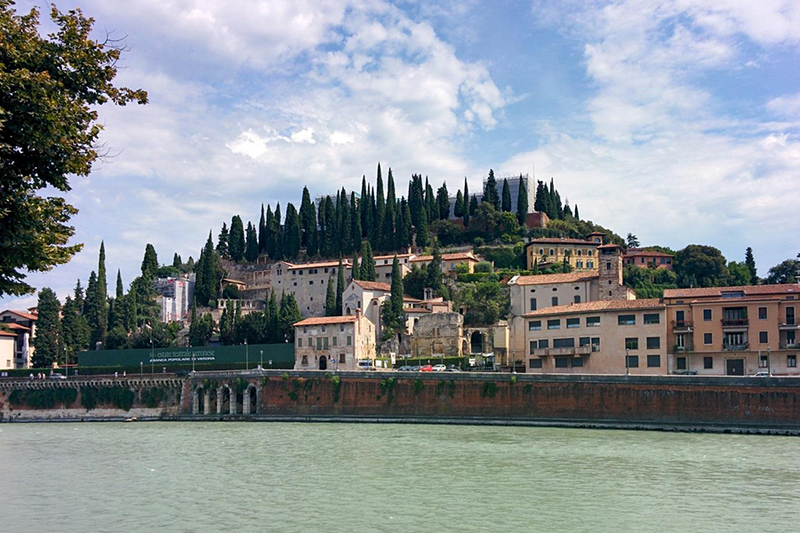 Verona is a small Italian city, probably most known for being the hometown of Romeo and Juliet. You can actually visit Juliet’s house and balcony! Of course, don’t leave the city without going to the Arena, which is still used today as a theatre. It also has a beautiful river with amazing views of the typical Italian buildings. Verona is somewhat lacking in hostels, so if you are backpacking Europe this night might be a good excuse to treat yourself to some well-needed privacy.You could rent an Airbnb – use this code for money off your first booking. Or check out some of the cheaper guesthouses in Verona. The adorable Juliette House BB is only 50 metres from the actual Juliette House; it is decorated in boutique style and is very clean and well facilitated – and has a budget price to boot. For rates and to book, check here. I think just one day in Verona is more than enough, so after making sure you have seen the city’s attractions in the morning after your long day of travel, a side trip to Bologna to see more of the north of Italy is a great addition to your Europe itinerary. That’s one of the great advantages of the Interrail Pass, the flexibility! 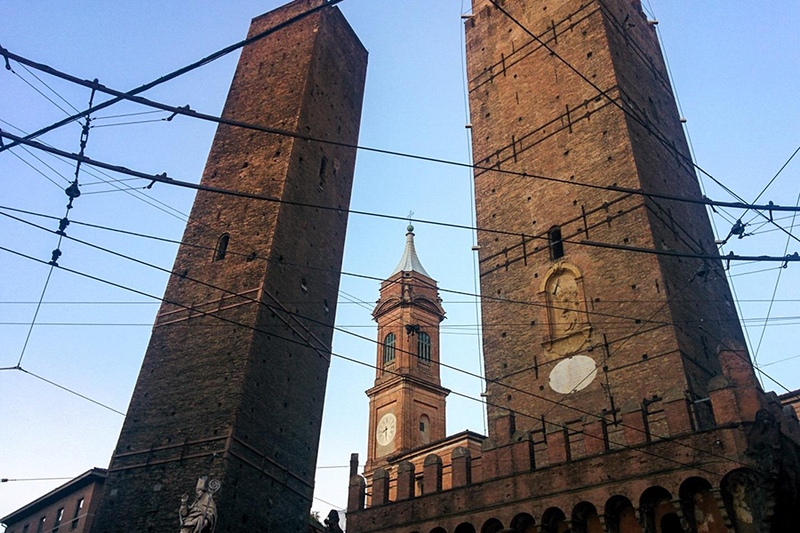 Bologna is a beautiful town, with lots of medieval style buildings. Some of the most famous ones are the two huge towers in the town centre, and, of course, the university, which is the oldest in the world! Bologna is the perfect place to enjoy the local food or learn about the weird stories about the town, like the war they had against Modena, cause by… a wooden bucket. Hostel – Loved by travellers, Dopa Hostel has comfy beds, friendly staff, and complimentary breakfast. Guests can also make use of free WiFi and a great location; it’s the ideal place to stay in the city. Check here for rates and to book. Hotel – Ramo Rosso di Paolo Natalini has comfy and spacious rooms, tastefully decorated with modern amenities, as well as an included breakfast and helpful staff. Click here for more information. 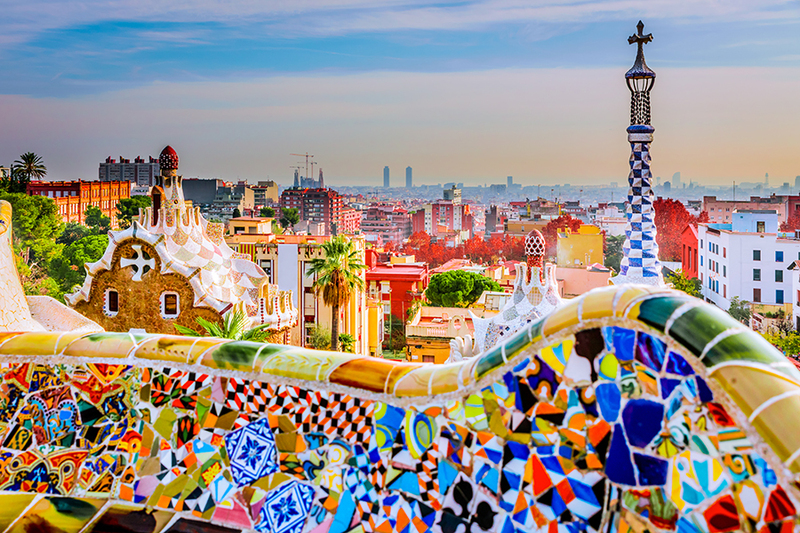 Your 1 month Europe itinerary now takes you westwards, towards the Iberian peninsula. The train from Italy to Spain is a long one, so it’s a great idea to break it up with some stops in some southern French cities. Culturally these cities are completely different to Paris; so they make a great addition to your European itinerary. The train from Bologna to Nice takes around 7 hours; so it’s best to get an early one and snooze en route – or you could even take a night train to save on accommodation. 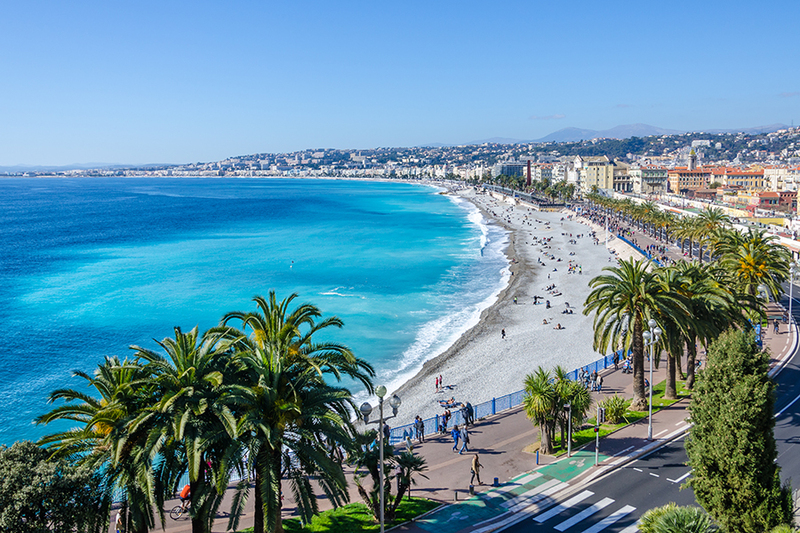 Once you arrive in Nice, head to the glorious old town. Some of Nice’s best attractions are here, including the Palais Lascaris Museum and the Église Saint-Jacques-le-Majeur de Nice. The Cours Saleya Market is open every day apart from Monday (when it becomes an antique market!) and is a great spot for purchasing local produce. The port is also a lovely place to pass some time, with colourful boats and lots of bars and restaurants. Hostel – After all that city trawling, you might want some beach time, right? Villa Saint Exupery Beach Hostel is just a 4 minute walk away from the nearest beach. The hostel price includes access to a fitness centre and a sauna, perfect for some chill time before your next stop. For rates and to book, click here. Hotel – Nice is pretty affordable when it comes to decent hotels, and Hotel 64 is great value for what you get. It’s in close proximity to everything, has amazing staff, and gorgeous clean rooms with fantastic facilities. Click here for more details. Another southern French city that’s well worth visiting on your western Europe travel itinerary is beautiful Marsaille. The stunning Notre Dame de la Garde, which sits on top of a hill and overlooks the sea, is a must-visit. 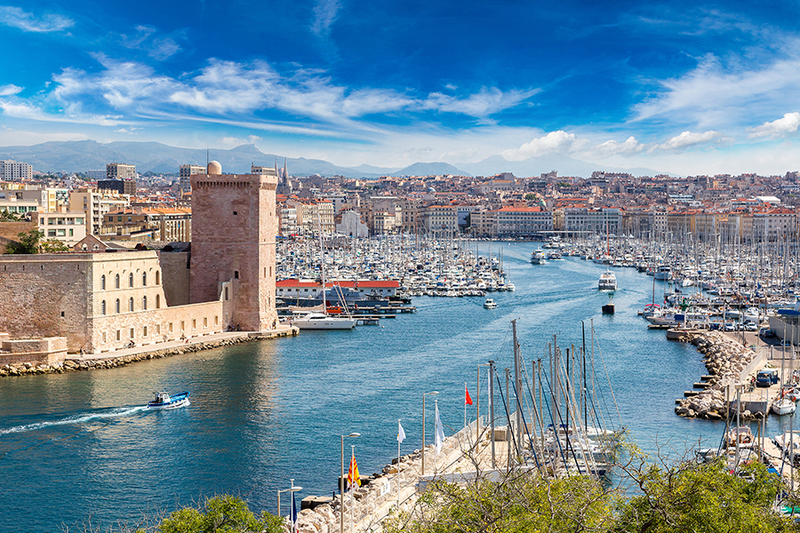 The Vieux Port and the old town are the most photogenic areas of the city, and a great bet, if it is raining, is to head to the Musee des Civilisations de l’Europe et de la Mediterranee (MuCEM), which explores Mediterranean culture and history. Hostel – Right by Vieux Port is Hostel Vertigo Vieux-Port, a popular backpacker hangout with a shared kitchen and a Mediterranean style lounge area. Breakfast is included in the price. Check here for rates and to book today. Hotel – The chic yet affordable Staycity Aparthotels are a great place to rest your head. With clean facilities, free wifi, and modern furnishings, this aparthotel makes a great stay. Click here for rates and to book. Welcome to Spain! You might be exhausted by the time you arrive in Barcelona, but the atmosphere of this effervescent city will quickly boost you back up. There is so much to do and see in Barcelona! 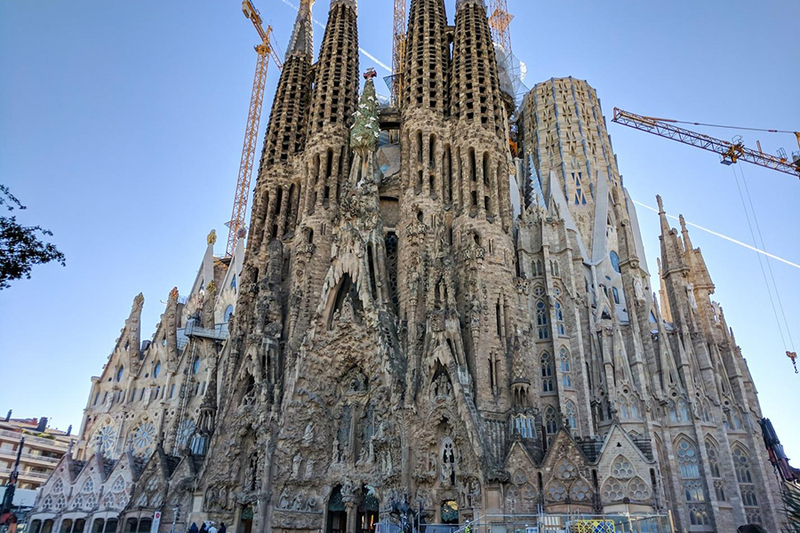 The main sight of the city is, of course, the Sagrada Familia Cathedral. This unfinished massive church in the middle of the town is the Gaudi’s masterpiece. It has been in construction for over 100 years, and won’t be finished at least for another 20. From there you can take the Gaudi Avenue up to the Hospital de Sant Pau, a UNESCO World Heritage Site and a beautiful example of the Modernista architecture of Barcelona. Another great example of this style of building is the Palau de la Música Catalana. If that’s not enough architecture visit the Casa Milà, Casa Vicens and Casa Batló, the other famous buildings designed by Gaudi. If you haven’t had enough of Gaudi, head up to the Park Güell. All of these are UNESCO World Heritage Sites! In case you are wondering, there are seven UNESCO World Heritage Sites designed by Gaudi in Barcelona! Of course, a visit to Barcelona is not complete without going to Plaça de Catalunya and walking down La Rambla, the most famous street in the city. From there explore La Boquería, the traditional market where you can find fresh food. Keep walking down and turn left to get into the Gothic Quarter, where the big 19th century avenues and streets become medieval twisted alleys. Here you can find the Barcelona Cathedral or the old Roman and Medieval walls. Not far away is the number one spot for many tourists: the beach! It’s not the greatest beach ever but the Mediterranean is always pleasant. From here you can walk to the Port Olímpic, the Olympic Harbour, where the games were celebrated in 1992. Nearby is another landmark of the city, the statue of Christopher Columbus, famously pointing in the wrong direction. And be sure to pass through Plaça d’Espanya before ending your time in the city. It is a huge square with two very famous towers modelled on the campanile of St. Marl’s Basilica in Venice, and for that reason, they are called the Venetian towers. Costa Brava Coastal Tour with Snorkelling. Click here for more information. Hop-On Hop-Off Barcelona City Tour. Click here to learn more. Hostel – In a city as big as Barcelona, accommodation options are plentiful – but due to Barcelona’s mass tourism, staying in the city isn’t cheap! But Generator Hostel Barcelona manages to twin luxury with great value. Each bunk has its own reading light and power sockets and all dorms are facilitated with air conditioning and heating. Breakfast is available at an extra cost, and the Gràcia area in which the hostel is located in a buzzing part of the city with lots to do. For rates and to book, click here. it would be a shame to venture all the way to Spain by rail and only see Barcelona – its capital, Madrid, is very different and a lot less touristy than Barcelona! Awash with museums, churches and amazing eateries, there is plenty to do in two days in Madrid. 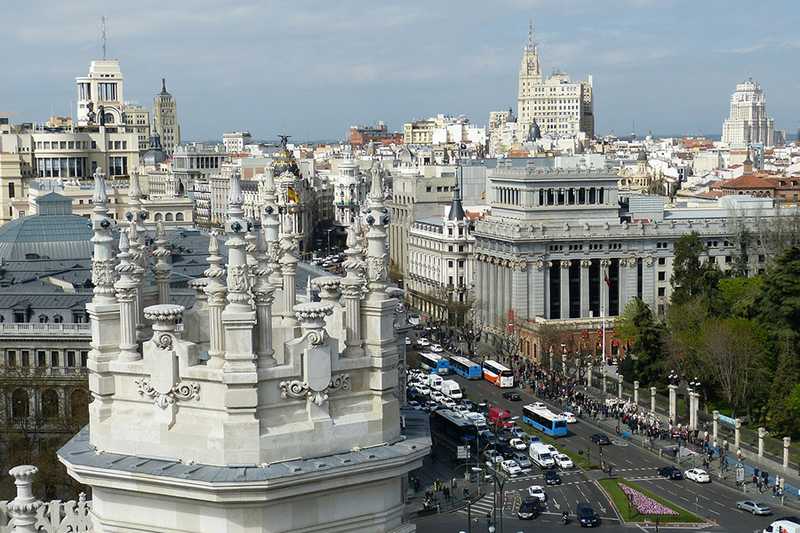 The most famous street in Madrid is the Gran Via, and is a great place to orientate yourself. Plaza de Oriente is located near the Royal Palace of Madrid and Almundena Cathedral, both of which are worth checking out. Plaza Mayor is a fantastic spot for lunch. Plaza de Espana, Casa de Campo and the Temple of Debod can be explored in the afternoon. Spend your last day in Spain seeing some of Madrid’s galleries and museums, such as the Prado Museum and Retiro Park. Plaza de Castilla and Cuatro Torres are interesting spots that show a more modern side of the city. Spanish Inquisition Walking Tour. Click here for more details. Madrid Royal Palace Guided Tour. Click here to learn more. Hostel – D’Hostel Madrid offers a central location and great features making this an excellent place to stay. Some dorms have a kitchenette, and there is a large lounge and kitchen in the communal areas. Breakfast is included. Check rates and reserve by clicking here. Hotel – Only YOU Hotel is audaciously funky, with enthralling decor in reception and the bar and restaurant, and a personable air to each perfectly clean boutique-style bedroom. Check rates and book here. One month Europe itinerary: where to next? And that’s a wrap! You’ve covered a lot of ground during this month in Europe, so give yourself a big pat on the back! 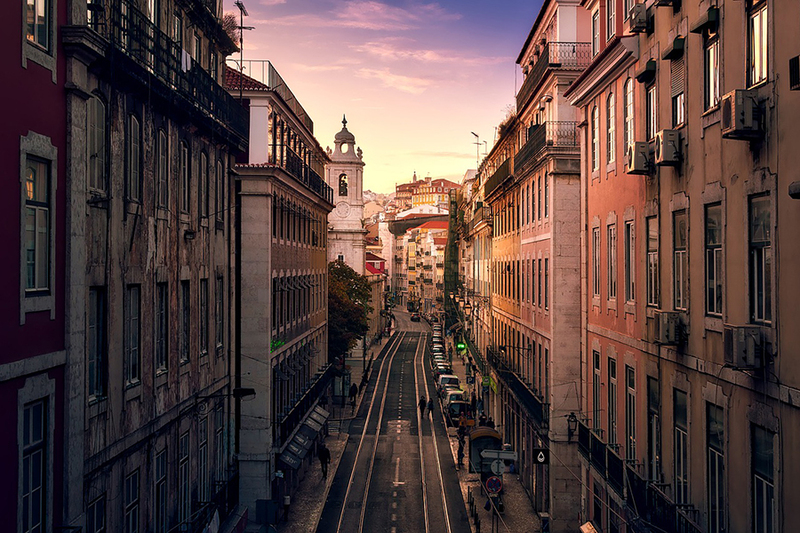 From Madrid, you can travel to lots of destinations; if you have a bit of extra time, why not turn your trip into a 5 week Europe itinerary and visit Portugal too? Or take advantage of Madrid’s cheap flights to South America, or visit North Africa… the choice is up to you! For this Europe itinerary, 4 weeks has been chosen as the optimum amount of time. This is because the rail passes are most cost-effective if they are bought for a month. But it must be stressed that Europe is such a culturally vibrant area; you could spend months in France or Italy alone. If you have more time in Europe, why not return to the country that intrigued you the most? 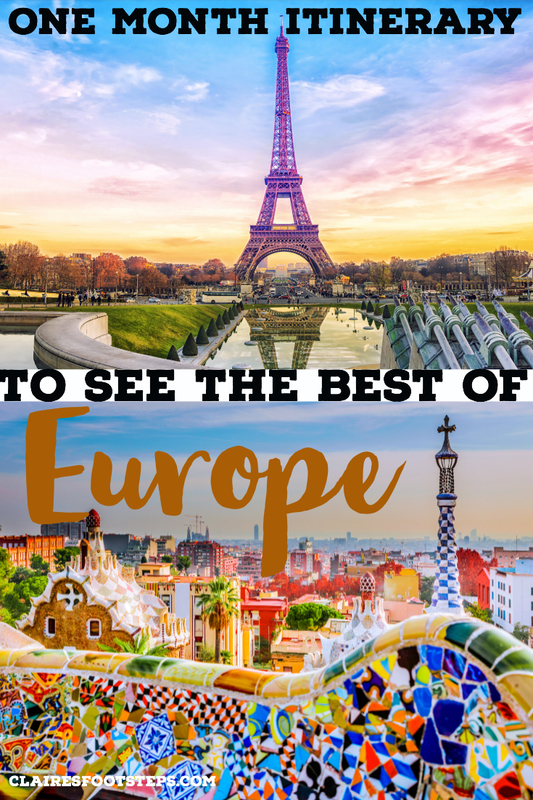 There’s so much to explore in this continent, and this Europe trip itinerary is just a taster! This is a guest post by Daniel from Travel in 35mm. Keep up with his adventures on Facebook and Instagram! 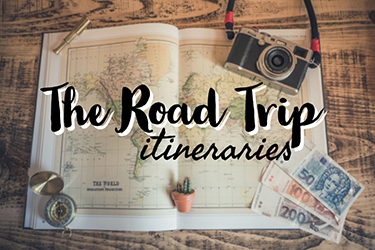 Save this itinerary for later – Pin Me! Brilliant! i live in Europe but haven’t been in even half of those places yet. Nice suggestions. This is one the amazing posts. Thank you so much. Is there any way you can provide rough expense estimate including everything? Hotels, Trains, Buses between all above locations? It would be really helpful to know just range of amount. Thank you so much. This is what I was looking for, for a long time. I am near my retirement age 63 yo (still very active) , I am considering touring the major cities of Europe with my granddaughter who is 15 years of age to introduce her culture and history. I don’t want to spend too much money, just the basic transportation and accomodation. You have answered many of the questions I have. Am so happy to have read your article. Planning to do my trip next year. Plan to include, Rome, Portugal and Greece in my trip. Any tips you can share on how I can insert them in my travel plan base on your iterinary. Thanks. This is great!!!!! Thank you so much for sharing!!!! This is what exactly what I was looking for as I am starting to plan our 30 day trip to Europe (scheduled for the month of July 2019). I will substitute some recomended cities for other of my interests!!!! Also, my husband and I are traveling with our 2 kids (8 and 9), hope this trip is not too much for the kids! They are looking forward to it!!!! Can you give us an idea of your total expense in those 30 days please!!! Thanks for the tips. That’s a great 30 days plan trip. 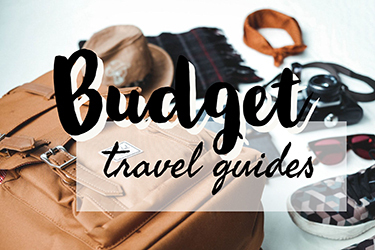 Can you give us or estimate the total expenses or budget on the trip?